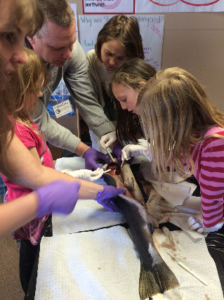 Palouse Prairie students demonstrate deep understanding of scientific concepts. Students regularly apply scientific thinking and inquiry to build mastery of scientific concepts and real-world scientific applications. 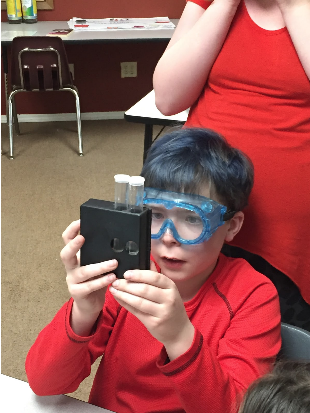 Our students are scientists, curious about the world, able to make careful observations, and they are inspired to make a difference in their world. Expeditions offer multiple opportunities to promote scientific inquiry and learning about real world topics that compel our students to work toward deep understanding of scientific issues. Our evidence shows student work that demonstrates how scientific learning is conducted at PPCS and standardized test data that confirms our students’ deep understanding. PPCS students demonstrate mastery of scientific knowledge on standardized tests. 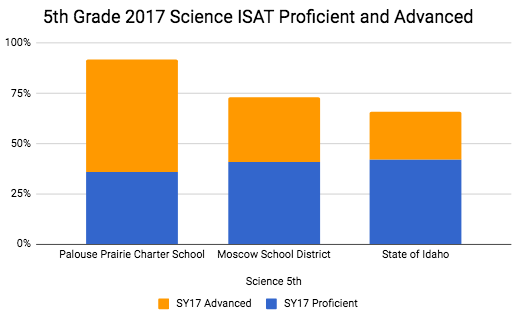 This is evidenced by overwhelming proficiency on the Science Idaho Standard Achievement Test (ISAT), which is administered in 5th and 7th grades. On average, nearly 90% of PPCS students demonstrate mastery (proficient or advanced) of scientific content. PPCS students significantly outperform the local district and the State of Idaho. The graphs below show Science ISAT data for the school years 2015, 2016, and 2017. Palouse Prairie School demonstrated both growth and overall proficiency in 5th and 7th grades from 2015 to 2017. The average proficiency in 2015 was 72% and increased to 87% in 2017. 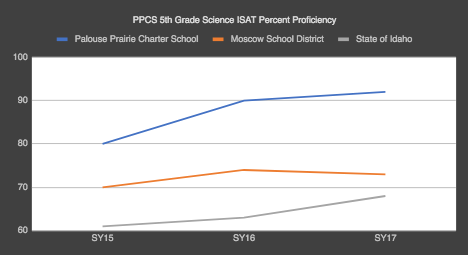 While the state and district show downward trends in data, PPCS continues to show a growth trend in our students’ proficiency on the Science ISAT. In addition, our students outperform Moscow School District and the State of Idaho. For example, in 2017, PPCS 5th-graders demonstrated 92% proficiency, compared to 73% in the local district and 68% of 5th graders statewide. PPCS 7th-graders demonstrated 82% proficiency in contrast to 60% proficient in the district and 53% statewide. In general, PPCS students outperform the local district by about 20 percentage points in both 5th and 7th grades. PPCS students outperform the State of Idaho by nearly 27 percentage points. 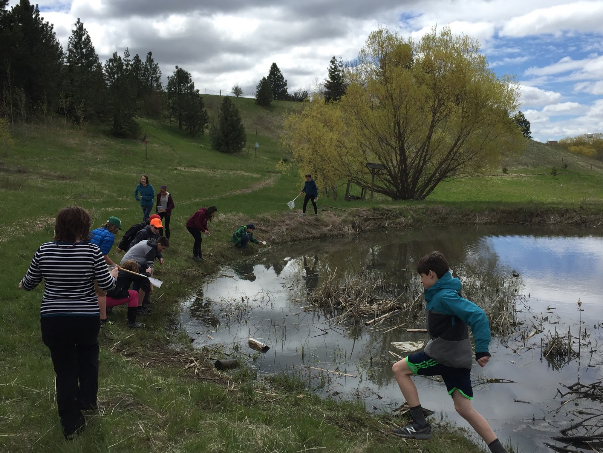 Perhaps more telling is that Palouse Prairie students not only demonstrate proficiency of scientific knowledge, but in fact, the majority of students demonstrate advanced knowledge. 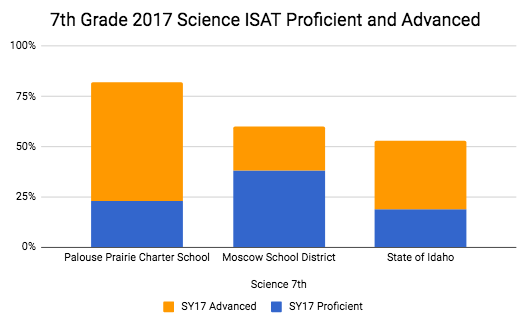 The tables below show that nearly 60% of 7th-graders demonstrate advanced knowledge, and 56% of 5th-grade students are advanced. This means that, on average, 58% of PPCS students demonstrate advanced mastery of science content. 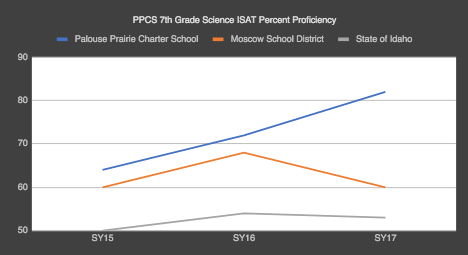 In comparison, an average of 27% of Moscow School District students score advanced, and an average of 29% of students score advanced statewide. This means that PPCS students outperform the local school district and the state by about 30 percentage points when it comes to demonstrating advanced science knowledge. Overall, PPCS students demonstrate deeper mastery of scientific content relative to their city-wide and state peers. Students demonstrate high proficiency on standardized tests because rich science content is embedded in expeditions throughout every grade. Learning expeditions are the signature curricular structure in EL Education and are integral to PPCS science instruction; nearly all science content standards are taught within the expedition framework. Expeditions give content standards deeper context and meaning and, as a result, they are an excellent curricular tool for developing scientists with deep understanding of concepts. The following snapshot of science instruction from three expeditions provides a closer look at student work in order to demonstrate how students across grades build scientific knowledge and skill in addition to inquiry-based problem solving and critical thinking. Science instruction is grounded in standards-based content mirroring real-world skills of practitioners. Learning is measured through assessment using Idaho State and Next Generation Science Standards. What are the characteristics of a plant? How do we help plants? Kindergartners work with real-world scientific tools – Wisconsin Fast Plants, to learn about the parts of a plant and what makes plants different from other living things. Students learn about the life cycle of plants and what plants need to grow. 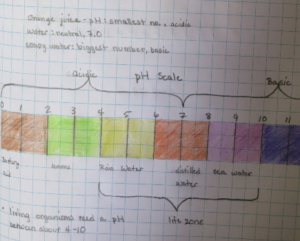 Students keep a science notebook to record observations and track their learning. Next, they learn about plants as food. Students learn how food goes from a seed to the food in a lunchbox. The CREW applies the knowledge they gain in the first case study to grow their own food plants. Vegetable-rich recipes are evaluated and students collaborate to map a garden that would provide the plants needed in each recipe. The kindergarteners’ final product is a set of plant information tags that could be used in any garden. The tags feature a Van Gogh-style collage on the front and student-written information on the back. This expedition exemplifies how scientific content and real-world synthesis is taught at PPCS, even with our youngest learners. 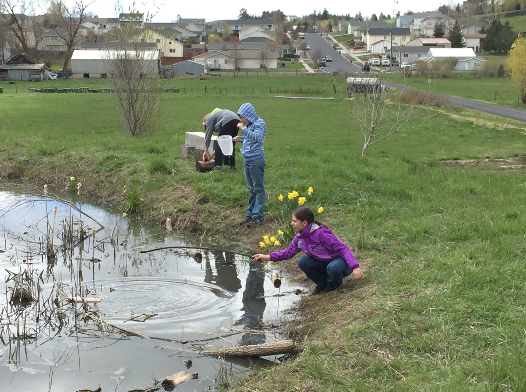 In 3rd grade, students are on a mission to answer the guiding question: How do natural and human-made elements impact ecosystems in the Pacific Northwest? They start by building background knowledge about what the Pacific Northwest is and how to use a map of the Northwest to trace the salmonid migration. 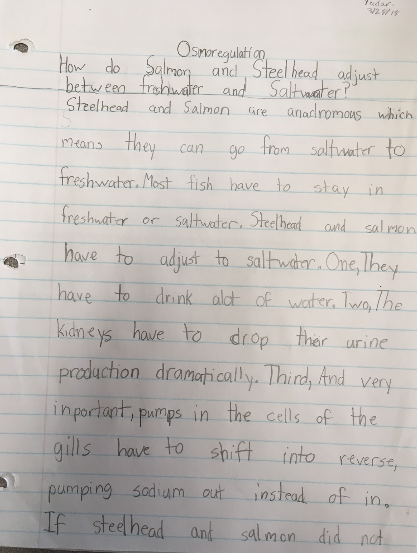 The first case study focuses on salmon and steelhead and how they are designed to survive their anadromous (freshwater to saltwater) migration. 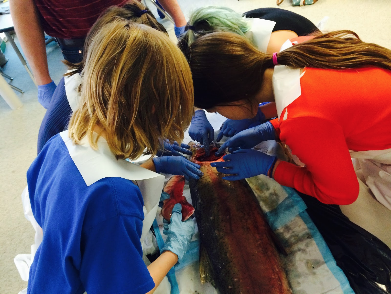 Students work with experts to dissect fish and learn about fish anatomy and make careful scientific observations. Students also raise steelhead trout from eggs to smolt, making observations about the development and life cycle of the fish. The second case study focuses on how human-made elements impact their migration and their place on the endangered species list, namely the eight dams along the Snake and Columbia Rivers. The final product in 2017 was ​a scratch art T-shirt that students created to remind people that being knowledgeable is key to making smart decisions and finding balance between the human-made world and the natural world. 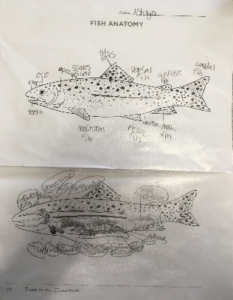 In 2018, students wrote letters to Idaho Fish and Game to explain how learning about endangered salmon and steelhead in the Pacific Northwest has impacted them and their view of the natural world and human responsibility. The letters are an effort to save funding for the “Steelhead in the Classroom” program that the 3rd graders participate in every year. 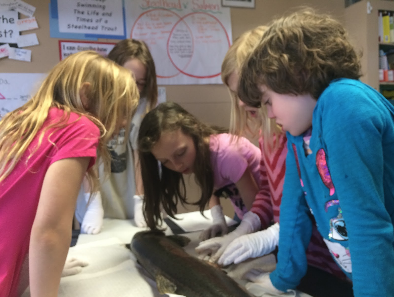 The program provides experts in the classroom and gives students the opportunity to raise steelhead egg-fry in their classroom, conduct a steelhead dissection, and visit hatcheries and dams in the area. This expedition clearly demonstrates how students work with compelling scientific content and use real-world instruments, tools, and practices to learn content. Sixth graders explore water quality with the guiding question, “How Clean is Clean Enough?” The class conducts three case studies to consider different aspects of water quality and quantity. In the first case study, students examine how water moves in, on, and around the earth (the water cycle). In the second case study, students evaluate their water footprint and examine how the local aquifer is affected by water consumption. Students do an inventory of their own home’s faucets and shower heads to determine if their household would benefit from water-saving devices provided by the City of Moscow. For the third case study students evaluate how physical, chemical, and biological parameters affect water quality. In some years, 6th-graders have integrated their learning about water at science camp, evaluating watersheds and learning about different water quality parameters, such as dissolved oxygen, pH, temperature, and conductivity to understand how to assess water quality. For the final product shown here, the class conducted a watershed assessment of a local environmental education campus, PCEI, in order to evaluate the water quality and create an informational poster to help the non-profit organization with future fundraising. Students collected water-quality data, and worked to become experts in each of the water-quality parameters collecting data for turbidity, conductivity, nitrates, phosphate, dissolved oxygen, pH, and macro invertebrates. The final product was an informational poster that showcased student work, which serves as an instructional tool for other educators, and as a fundraising instrument to show potential donors what kinds of rich tasks the environmental campus can support. This expedition exemplifies real-world application of rigorous scientific content that is engaging to students. PPCS students identify themselves as scientists. They think like scientists and have the tools and skills to act like scientists that collect data, test hypotheses and apply their scientific knowledge to new situations. Each year, students have science-rich expeditions that not only allow students to learn about new scientific ideas, but allow students to practice the mindsets and practices that promote deep scientific understanding. Our standardized assessment data support our claim by showing that PPCS students far exceed the state and district in proficiency on the Science ISAT, and that our students aren’t just proficient- they show advanced understanding of the assessed concepts.